Today is a public holiday – its Constitution day. To be honest, I don’t really know what that entails for the Mexicans, but I do know it meant that I could sleep in until 10am, have my Peruvian make me banana pancakes for breakfast, lounge around in my pajamas until 2 before getting ready to go for a late lunch at 3 – perfect way of spending a day! A couple of hours ago it started to rain – giving this day an even cosier feel. It also reminded me slightly of Christmas and I realised that I never posted any of the wonderful food that was made over the holidays. 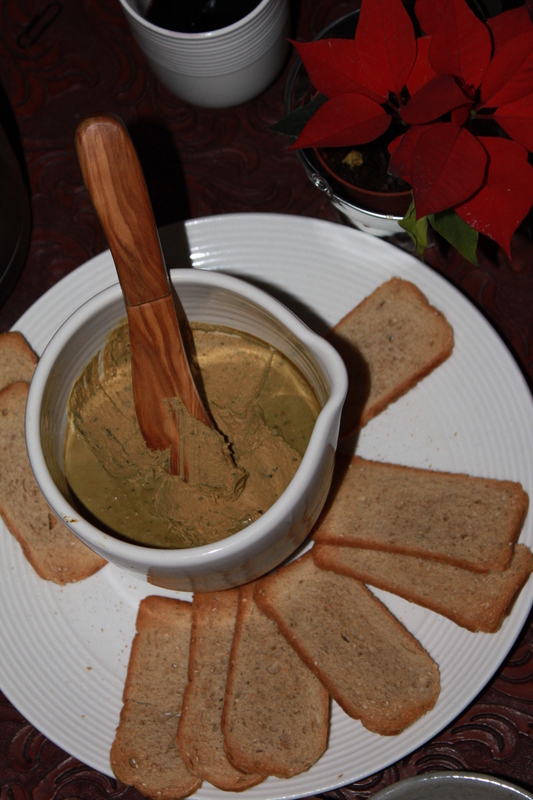 So I thought I would start with this simple recipe – Chicken Liver Pate. We tend to make this spreadable pate for Christmas, served over crusty bread or Melba toast as part of our Smörgåsbord (smorgasbord for you non-swedes) – but really there is nothing especially ‘christmasy’ about this dish, and I reckon it would be a great hors d’oeuvre for any occasions. What I also love about this dish, is its simplicity and not to mention affordability – here in Mexico I bought a bag of chicken lever for 5 pesos…that is 40 US cents!! Now I must admit the picture isn’t all that good of a representation of what it should look like. For some reasons all the pictures I took were slightly blurry – must have been all that Glög – but at least this give you an idea of what it is – and I promise you it’s incredibly tasty! Fry the onions in about 25g or butter for a few mins. Add the chicken liver and herbs and continue to fry until the livers are cooked through. Once the chicken livers are cooked, set aside to cool for a few minutes before you pop them into a food processor. Add some pepper and salt, garlic, butter and brandy and liquidise it until it forms a smooth paste. I actually added a little bit of cream which I felt enhanced the texture and gave it a lovely smooth flavour. Taste to see if it needs any extra seasoning. Then pour it into a bowl and pop it into the fridge for at least 4 hours before serving (or prepare it the night before).